Dalla vendita NAC 54 del 24-03-2010 al lotto 96 , un bellissimo esemplare di didramma ( Seltman 455a , 475-465 A.C. , 8,60 g. ) , per l'estensore del catalogo "extremely rare , among the finest , if not the finest , of only ten specimens in private hands" : ex vendita Hirsch XXI , 1908 . Ad Atene i didrammi , monete tipo del periodo arcaico delle Wappenmunzen , con l'introduzione delle nuove tipologie con testa di Atena / civetta dopo il 510 A.C. , diventano tipi pressoché marginali e rari nella monetazione . Aggiungo un secondo esemplare dal BMC ed un terzo dal manuale greek coins di Sear . Pare che i didrammi conosciuti di questo periodo siano solo 42 di cui solo 10 in mano privata!!!! ATTICA, Athens, Circa 475-465 BC. AR Didrachm (8.49 gm). 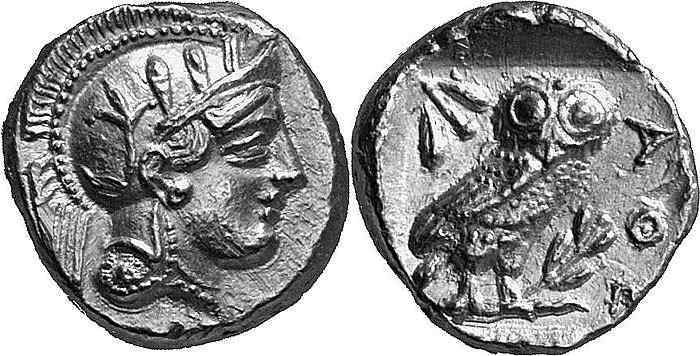 The historical context of this Athenian didrachm, as well as concomitant tetradrachms and celebrated dekadrachms of the same class, has been the matter of much debate. The evidence from the 'Dekadrachm Hoard' confirms the picture suggested by Kraay (ACGC, pp. 66-68), of a rapid evolution from Starr Groups II to V. The relative state of wear on the coins in the hoard, with Group II being, generally, about extremely fine and Group V being mostly mint state, clearly demonstrated that only a short period elapsed between the former and the latter. The key historical dates are the battle of the Eurymedon River in 467 BC, where the Persian booty was enormous and is attested to have been distributed (Plutarch, Kimon 13. 6-8), and the capture of Thasos and its mines in 463/2 BC, where the plunder may be assumed to have been very substantial (Plutarch, op. cit. 14. 2). It is now generally accepted that the didrachms, tetradrachms, and dekadrachms of Class II must have been struck in the 460s BC, and it seems clear that such exceptional and compact issues must have served some special function. According to the comprehensive census conducted by Harald Salvesen (The Celator, vol. 10, no. 2 [February 1996], p. 6-7), the total of known Athenian didrachms is 42, with only 10 in private hands and three unaccounted for. Stater (Gold, 8.59 g 9), 407/406. Head of Athena to right, wearing crested Attic helmet with three olive leaves over the visor and spiral palmette on the bowl. Rev. Owl standing to right on olive branch, head facing; behind, olive spray and crescent moon. ACGC 202 (Oxford). Dewing 1624 (same obverse die). Jameson 2495 (this coin). Robinson Pl. I, 9-12 (9 = this coin, 10 = Dewing, 11 = BM, 12 = Oxford). One of the greatest rarities of the entire Greek series, one of four known examples, and one of the most historically important coins in existence. Minor scuffs, otherwise, extremely fine. From the de Guermantes collection, and that of Robert Jameson, 2495, said to have been found near Tegea in Arcadia.The Peloponnesian War (431-404) was the greatest of all inter-Greek wars and ranged Sparta and her allies against Athens, her Empire and her allies. For most of the first part of the war the Athenians were the most successful, but the disastrous Athenian expedition to Sicily (415-413), ending in the total destruction of the Athenian force, was he beginning of the end. Another severe blow came when, in 413, the Spartans took the Athenian fortress of Decelea in Attica, and cut the city off from much of its hinterland, including the vital silver mines at Sounion. With silver coinage drying up due to the Spartan blockade and the escape of the slaves who worked the mines, Athens was forced to turn to her last reserves. Among those reserves were the eight Golden Nikai: these were statues of Nike, dedicated in pairs, and each with a framework covered by detachable plates of gold weighing two talents. The gold parts from seven of those statues, plus other golden dedications from the Acropolis, were melted down to make coins in order to pay for equipping a new fleet to defend the city. It is estimated that the gold from the Nikai alone (see W. Thompson, The Golden Nikai and the Coinage of Athens, NC 1970, pp. 1-7; ACGC pp. 68-69; E. S. G. Robinson, Some Problems in the Later Fifth Century Coinage of Athens, ANSMN IX, pp. 1-15, esp. p. 9) totaled 84,000 gold drachms by weight. Of this emergency coinage, which included gold staters (or didrachms), drachms, triobols, diobols, obols and hemiobols, only a very small number of coins managed to survive until today (there are only four staters in existence, one in the Dewing collection at Harvard, one in London, one in Oxford and the present piece). As coins they are a memorial to some of the most stirring events of the fifth century B.C., while the gold with which they were made comes from some of the most beautiful of all fifth century sculpture. As such, this is one of the most historically exciting coins anyone could ever hope to own. Interessante discussione. Non ero a conoscenza dell'esistenza di questo raro nominale. É noto a cosa sia stato dovuto il cambiamento del sistema monetario rispetto al periodo precedente?